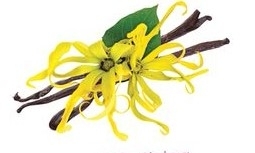 Ylang Ylang has been an important element in perfume for years. Chanel No 5 perfume contains it. Lampe Berger's Ylang's Sun has top notes of Vanilla, Taire flower and orange blossom with mid-notes of Ylang Ylang, coconut and amber. It is underlayed with a base of vanilla and precious woods.